ROCHESTER, N.Y. – Semrock, the leader in optical filters for biotech & analytical instrumentation, has expanded its popular BrightLine® family of fluorescence filters with a new series of high-performance long-wave-pass filter sets that are specially optimized for laser-based microscopes and imaging systems. 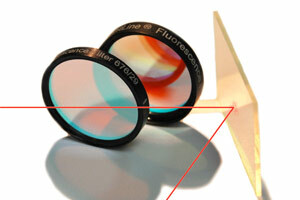 Semrock's laser fluorescence filter sets are designed specifically for laser-based imaging applications. These offer wavelengths precisely keyed to important excitation laser lines (such as 405, 488, and 561 nm), deep blocking at the laser wavelengths to minimize noise, and highly flat and anti-reflection (AR) coated dichroic beamsplitters for producing clear images free from the artifacts often seen in laser microscopes. Semrock's new laser fluorescence filter sets with high throughput long-wave-pass emission filters capture even more light, and are ideal for fluorophores that have widely separated absorption and emission spectra. With exceptionally steep transitions (less than 2.5% of the laser wavelength) between the laser wavelength and the passband region, along with high-transmission (typically greater than 98% average) emission filters extending to 900 or even 1200 nm, these filters are optimal for capturing even the weakest fluorescence signals. BrightLine laser fluorescence filter sets are well-suited for use in laser-scanning and spinning-disk confocal microscopes, as well as total-internal-reflection fluorescence (TIRF) microscopes. They are also ideal for any fluorescence microscope or imaging system that demands premium spectral performance and/or beamsplitter flatness, such as structured illumination systems for reduction of out-of-plane noise. Like all of Semrock's comprehensive family of optical filters, the new laser fluorescence long-wave-pass sets are exclusively manufactured with hard-coated Ion-Beam Sputtering technology for our "no burn-out" reliability, and they are confidently backed by an industry-leading five year warranty. The new sets ship quickly from stock. Semrock and BrightLine are registered trademarks of Semrock, a Unit of IDEX Corporation.